Australian cities are getting hotter. The many reasons for this include urban densification policies, climate change and social trends such as bigger houses and apartment living, which leave less space for gardens and trees. But some areas and some residents of cities are more exposed to heat than others. The concentration of poorer people in hotter places is known as “thermal inequity”. Our recently published research has found this is a real concern on the Gold Coast, one of Australia’s fastest-growing urban regions. Urban heat is known to increase rates of injury, death and disease. This is why the federal government recently established an urban greening agenda. The central city tends to be hotter than surrounding suburbs and rural areas – the urban heat island effect. Perhaps because of this, much of the research focus has been on the urban core. But what about heat effects in the suburbs? Research from North America and Australia shows people who live in greener, leafier suburbs tend to be wealthier. We know that urban greening can cool ambient air temperatures. Plentiful street trees, well-designed parks and other types of green space also tend to increase residents’ physical activities and social interactions. This makes greener neighbourhoods healthier and happier. Unfortunately, the opposite often occurs in poorer suburbs, meaning residents suffer more heat stress. This is a consequence of fewer street trees, less green space and denser urban design. Our research found thermal inequity is a real concern in Upper Coomera, a suburb in the northern growth corridor of Gold Coast city. The Gold Coast has been coping with explosive rates of growth. The population is expected to double to more than 1 million in the next two decades. Growth-management policies are increasing densities in many suburbs. On the suburban fringe in places like Upper Coomera, land clearing for development typically removes much of the native vegetation. This in turn increases heat. The trend in the Gold Coast, like many cities, is for comparatively disadvantaged people to seek more affordable housing in outer suburbs. Less affluent householders become concentrated in suburbs where housing is packed tightly with fewer trees and less greenery. Hotter houses and neighbourhoods lead to residents paying more for electricity to keep cool. Excessive heat can also increase healthcare expenses and reduce productivity. 1) Are residents aware of climate change? 2) Are residents concerned about climate change? 3) Do residents understand the potential of green infrastructure to help neighbourhoods adapt to climate change? Video abstract for Environmental Research Letters article on thermal inequity. We found more than 90% of residents were aware of climate change and almost 70% were concerned about it. Residents living in townhouses were particularly worried. Paradoxically, those living in dwellings with dark roofs were less worried, as were those with larger families. We also found that more than 90% of respondents had air conditioning. Using statistical analysis, we determined that renters are especially vulnerable to associated energy costs, as are those with kids. Interestingly, we found that people living in townhouses were less likely to consider buying energy-efficient devices to lower household energy expenses, as were those with more children. This could be because renters and those with larger families may be struggling financially. In sum, we found that more disadvantaged households with less disposable income were living in dwellings that were more vulnerable to heat. Next, we examined the attitudes of residents to urban greening to help combat heat in their neighbourhood. We found almost two-thirds favoured tree planting. More than half felt local streets lacked shade. 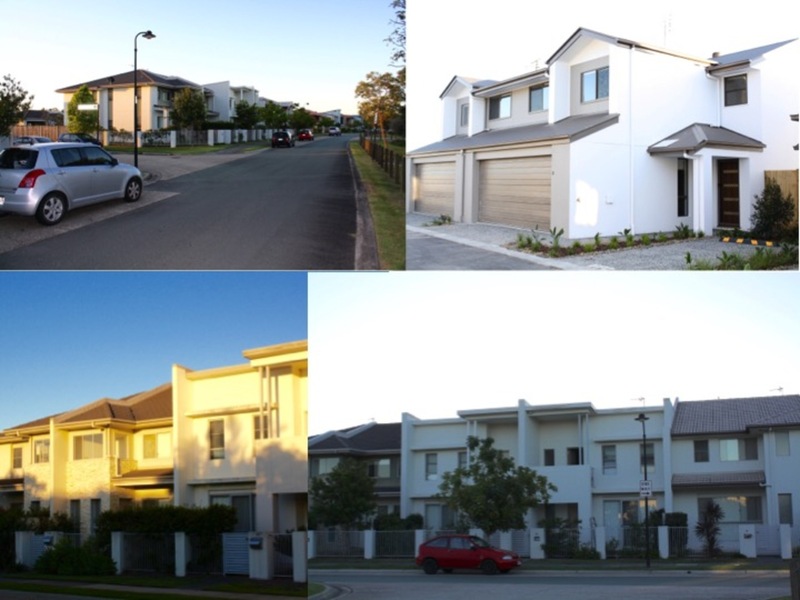 Few trees to be seen: residential landscapes in Upper Coomera. While 90% of surveyed residents saw that shade was a key benefit of trees, just over half understood that trees can lower air temperatures. Although most residents recognised maintenance costs of trees as a disadvantage, they still favoured more urban greening. Our findings have important repercussions for urban policy. As we have previously noted, urban greening has many advantages for climate change adaptation. It is comparatively inexpensive and is politically palatable. However, higher-density neighbourhoods like Upper Coomera often have less land available for greening. Yards are smaller and verges are typically dominated by on-street parking. We advocate for education campaigns about the benefits of urban greening and better urban design guidelines to make it easier for developers to increase neighbourhood greenery. Better knowledge about species selection is needed to reduce maintenance issues. Urban greening initiatives should also use technologies like permeable paving to limit pavement uplift and capture rainfall on-site. Thermal inequity exists but it can be reduced. After all, if urban greenery can benefit all residents, why should the poor miss out? The authors wish to acknowledge the contribution of Chloe Portanger, Information Analytics Specialist with Climate Planning, to the research on which this article is based. Previous : Fat or thin: can the bacteria in our gut affect our eating habits and weight?